Sunday January 22 1893 I was busy about the house work all forenoon We were sleigh riding most of the afternoon. I invited company for tomorrow night. I stopped at Hatties while Will brought Father home. The folks brought Mother later. Mr & Mrs Stump and Ethel were here for supper. I read late in the evening. Monday January 23 1893 I was busy about the work all morning as I cleaned up the parlors. I spent the afternoon in town with the girls. They and the Woolfs with Mr & Mrs Woods and George Folsom spent the evening here. Charlie Hedges played the violin and we had a nice time. Tuesday January 24 1893 I was busy with the work all morning. In the afternoon I ripped up Wills old brown coat make him a dressing gown. The girls with Alice Horne called here on their way home from Woolfs. I knit in the evening. 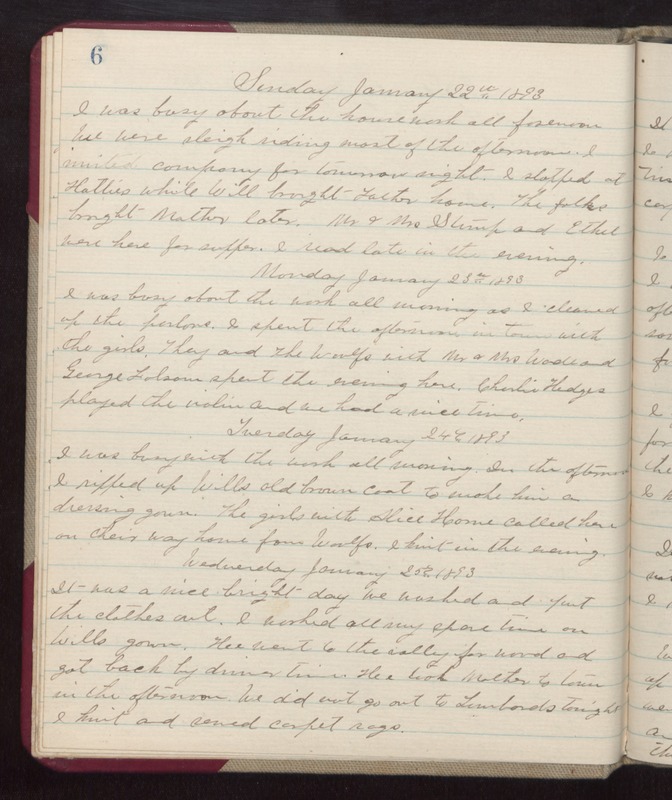 Wednesday January 25 1893 It was a nice bright day we washed and put the clothes out. I worked all my spare time on Wills gown. He went to the valley for wood and got back by dinner time. He took Mother to town in the afternoon. We did not go out to Lombards tonight I knit and sewed carpet rags.